Rabbit in Australia are commonly affected by fur mites and ear mites. Fleas are less common but occur when rabbits live with other species, or via wild rabbits. Intestinal worms are very uncommon. The chart below summarises the products that treat rabbit parasites. Please consult your vet for advice specific to your pet before use. Prices are available on request. Warning: Never use products any other products made for dogs or cats without veterinary advice. When treating multiple animals, they may groom and lick each other so keep separated until the product is not visible. Revolution can be safely applied to rabbits from 8 weeks of age. 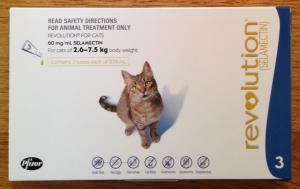 Use either Revolution for Puppies & Kittens or Revolution for Cats depending on your rabbit’s weight. Most fleas on rabbits come from dogs, cats or chickens so treating the other household pets is important. It is not clear at what age Advantage can be used, so it would be prudent to wait until your rabbit is 3-4 months old or over 1kg. Use the dark green Small Dogs and Puppies tube for rabbits under 4kg or the one pictured for larger rabbits. The solvent may damage clothing and painted surfaces so take care after applying it, and avoid placing it where the animal can lick.